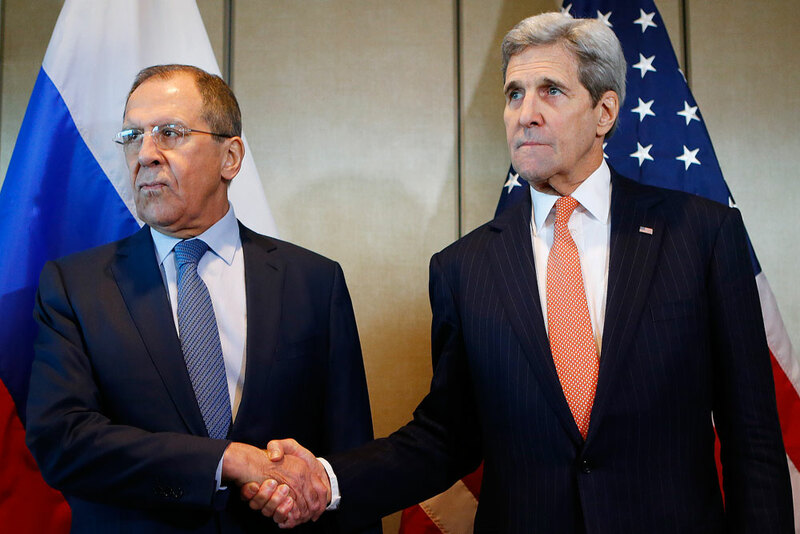 Russian Foreign Minister Sergey Lavrov, left, and U.S. Secretary of State John Kerry shake hands prior to bilateral talks in Munich, Germany. Following the announcement by world powers on Feb. 11 of a ceasefire agreement in Syria, to take effect “within a week.” RBTH asked several political analysts to assess the recent breakthrough and put forward different scenarios for the Syrian conflict. The United States, Russia and other members of the International Syrian Support Group have agreed to introduce a ceasefire in Syria in one week. The ambitious decision comes after a meeting of the Group in Munich, Germany on Feb. 11. If implemented, the ceasefire regime could mark a turning point in the protracted Syrian war and lead to a long-term political settlement. However, the parties’ commitments are yet to be tested in the coming days. RBTH talked to several political experts about the ceasefire agreement and its implications for the Syrian conflict. Some experts allow for the possibility of a local ceasefire, limited to some sections of the front lines. “This will likely be a local ceasefire agreement, not nationwide. It could possibly be introduced only in places where opposition forces will demonstrate their readiness to negotiate,” said Nikolai Kozhanov, a non-resident scholar at the Carnegie Moscow Center and a contributing expert to the Moscow-based Institute of the Middle East. Observers in this camp do not see the ceasefire as a decisive step towards a final resolution to the conflict. Although the announced agreement may set a positive precedent for future negotiations, considerable change in Syria is not likely in the near future. A local ceasefire is unlikely to transform into a long-term peace process. For this to happen, the conflict parties must exhaust their ability to continue fighting, according to one of the analysts interviewed by RBTH. The cautious view sees no immediate breakthrough unless sides stop using their military advances as a bargain tool. Other experts see the announced ceasefire as a straight path to the final resolution of the Syrian crisis. They highlight international players’ demonstrated readiness to make compromises. The United States’ support for the Syrian Kurds in spite of fierce criticism from Ankara demonstrates the commitment of this major powerbroker to a final resolution in Syria. “President Obama, who will soon be leaving office, wants to conclude his presidential tenure with considerable foreign policy success and this includes making a decisive step towards peace in Syria,” said Vladimir Sotnikov, a lead researcher for the Institute of Oriental Studies at the Russian Academy of Sciences. Although it is not realistic to expect all the parties to support the ceasefire, the agreement of major members of the Syrian Support Group will suffice to establish a lasting peace, according to the observers interviewed by RBTH. Should this happen, the Russian leadership may consider the option of withdrawing its air contingent from Syria. A more pessimistic view dismisses the possibility of a secure ceasefire in the current uncertain military and political climate, with Vladimir Sotnikov of the Institute of Oriental Studies seeing the numerous military groups fighting the Assad regime independently from the United Syrian Opposition as a major obstacle on the road to a durable peace settlement. Simond de Galbert, a visiting fellow at the Center of Strategic and International Studies, agrees that a ceasefire is “more necessary than ever,” though he does not see it as a realistic proposition. “Russia and Iran look more interested in securing additional gains on the ground … than in interrupting their territorial advance,” he said.